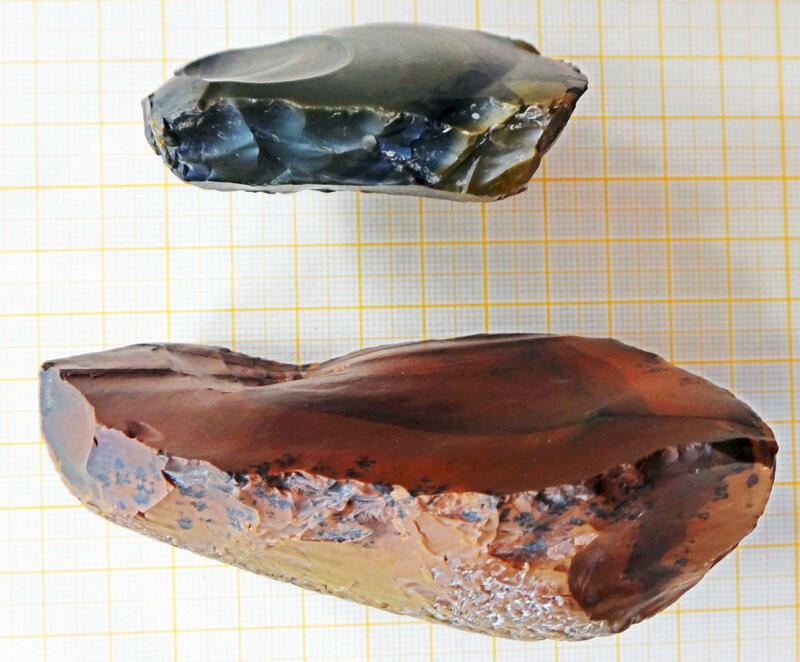 Anthropologists are thrilled - but puzzled - that sediment deposits in northern China where a large number of ancient stone tools have been unearthed appear to have been formed much earlier than the emergence of man's earliest ancestors. More than 400 fragments of stone implements have been found in a stratum of sediment that was originally thought to have formed 15 million years ago, Professor Wei Qi, a researcher with the Chinese Academy of Sciences, said. "It's quite intriguing, as the earliest Homo species who were known to be able to make tools appeared no earlier than 2.6 million years ago, in Africa," he said. "The sediment must be considerably younger than geologists thought, because no stone tools could have appeared so early. "But [the sediment] is still very old. If we can establish that it is older than 2.6 million years, we can give the well-established theory of African origin a big shake-up." The site is in Shibaozhuang village in the Nihewan basin, a famous - and controversial - anthropological site on the border between Shanxi and Hebei provinces. For nearly a century, anthropologists from China and around the world have unearthed at Nihewan a large number of stone tools up to 1.9 million years old, and Nihewan was thus regarded as one of the most hopeful sites in China for finding the earliest traces of the Homo genus. But the tools found in Shibaozhuang were different from any previous finds, according to Wei, who after his retirement moved his home to Nihewan to search for ancient human remains. Most of the tools were made from jade stones such as agate, while the tools from other sites in Nihewan were mostly made with ordinary stones. "They are the most beautiful and refined stone tools that I have ever seen in the area," Wei said. And the sediments that contained these tools were thick and extensive, at least 70 metres deep judging from what has been exposed, and several square kilometres in area. "The sheer scale and continuity of the sediment is extremely rare in the world. For probably millions of years it faithfully preserved the artefacts produced by ancient homo species. For anthropologists it is almost like Treasure Island." The tools were also of higher quality than those from other sites in the region. Many of them had been worked on three, four or even five times. The tools made of agate were harder and sharper than those made with ordinary stones. "The early Homo species might have used them as tools to cut meat or trim beards, but they might also have used them as gifts for lovers due to the stone's vibrant and beautiful colours," Wei said. "Most of the time they were cutting the stone probably not for work, but for fun, and the practice might have well been carried on continuously for millions of years." Wei said he and some other Chinese anthropologists had known about Shibaozhuang for decades but had never made careful checks there because the sediments had long been determined by geologists to be at least 15 million years old because of its large reserve of gemstones. Not until this past spring did a farmer discover some stone tools in the local gem market and reported the find to Wei, who conducted several trips to Shibaozhaung to confirm the discovery. Wei said the biggest challenge now was to determine how old the sediment was. "I have talked to several experts in the field and they all scratched their heads due to the technological difficulties involved," he said. Wei said the Shibaozhuang site could have been formed near an ancient lake in Nihewan and covered up following a relatively recent volcano eruption. Pei Shuwen, another researcher who has visited the site, said the artefacts from Shibaozhuang provided an important clue to the activities of early Homo species in China, but whether they could challenge the African origin theory remained uncertain.